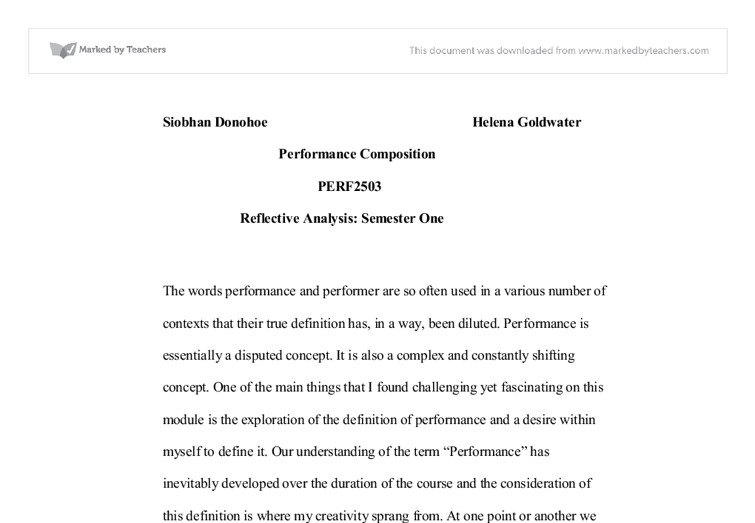 Siobhan Donohoe Helena Goldwater Performance Composition PERF2503 Reflective Analysis: Semester One The words performance and performer are so often used in a various number of contexts that their true definition has, in a way, been diluted. Performance is essentially a disputed concept. It is also a complex and constantly shifting concept. One of the main things that I found challenging yet fascinating on this module is the exploration of the definition of performance and a desire within myself to define it. 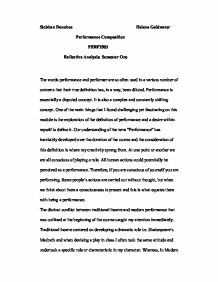 Our understanding of the term "Performance" has inevitably developed over the duration of the course and the consideration of this definition is where my creativity sprang from. At one point or another we are all conscious of playing a role. All human actions could potentially be perceived as a performance. Therefore, if you are conscious of yourself you are performing. Some people's actions are carried out without thought, but when we think about them a consciousness is present and this is what equates them with being a performance. The distinct conflict between traditional theatre and modern performance that was outlined at the beginning of the course caught my attention immediately. Traditional theatre centered on developing a dramatic role i.e. Shakespeare's Macbeth and when devising a play in class I often took the same attitude and undertook a specific role or characteristic in my character. Whereas, In Modern Performance, work is not based upon a character but rather the performers own experiences or own bodies as a stimulus. ...read more. This once again, reiterates the disputed definition of performance. That argument being- Can these dangerous acts be classed as performance? And theatre's questioning as to why these performers would go to such limits and what is the message they are trying to convey to the audience? When we had to write a review of our piece from the point of view of an audience member, this allowed me to develop my understanding of the expectations and requirements of an audience. Life encourages you to put the "Boot on the other foot" so to speak, this was reflected through this task of the review. After writing the review on my piece as if I had already performed it, I had cut out certain elements of my final piece as I didn't think they were appropriate after taking into account my personal reaction in the position of reviewer. The sections I had excluded from my final piece were intimate interactions with the audience, which after careful consideration believed them to have a more negative effect on the audience than a positive one. Performers should be attentive not only to the audience needs but also be aware of the audience- performer relationship. An audience member requires closeness to share in the experience and distance to observe it. My understanding of audience- performer relationship was crucial to the progression of my final piece. ...read more. The source being how the artistic observance of death helps illuminate life. Its echoed in my piece in the line where I say "Death is the mirror in which the true meaning of life is reflected." Overall I wanted to convey an alternative attitude to the deliberation over death. My development as a result of this module is not only restricted to developments in performance but also in art and even life in general. I had to question myself as to where I find my own uniqueness and identity? And how is this displayed through the act of performance. These are questions that prompted me on this module and where I found my source of encouragement. I have learnt to expand my imagination and see past the original idea at hand, this was helped in the exercise where we contemplated ten other locations for our piece. This allows us to engage more in the actual process rather than the conclusion to it. My ideas developed laterally as opposed to centering my attention on the final product. In my final piece I drew upon many of the aspects I have learnt in the exercises over the course of the module. And within each one I have developed my own sense of understanding towards different approaches and techniques. Some of the tasks set have challenged my existing ideas and given way to new and diverse methods which I hope to progress and build on in the future. ...read more. If any variables aren't controlled, then the experiment can be affected due to possible distractions, miss haps etc. Injury is an extraneous variable because if the participants are injured, then they physically won't be able to carry out the task, and will make them do worse. It was the task if the health courts to sterilise the mentally incompetent under the nazi racism. Petersen's entrance into the court is very endearing. He is absolutely terrified, his hands lead the way, his body following. This action shows the audience how he is trying to put the moment off for as long as possible. the Birling were awakened to the wider world and were forced out of their comfortable surroundings. A further extension on this idea was when the Birling family was forced out of the house down to the street - when the shocking news was brought out into the open. Three sister Anton Chekov analysis and review of a performance. I thought it was interesting that they chose a black actor to play his role. He was a very hard character to understand because of his "on edge" state of mind. At the beginning he claimed his undying love for Irena who rejected him with disgust and shock. Highlight of the show has to be the aerial glockenspiel, with players trapezing back and forth in time to strike their chimes. If there's one criticism, it's that one wishes that directors Steve McNicholas and Luke Cresswell had made everything as visually and choreographically co-ordinated at that. The Prince also lowered his head to his chest to produce an exaggerated deep tone of voice for the pears. This is contrast to his performance as the Prince when he stood up very straight with his chin pointed upwards to demonstrate authority. There was also much intimate physical contact such as hugging, leaning and pulling arms between Maudie and I to show that we're in a relationship. Most of the physical contact was initiated by Maudie, because she's obviously the one more in love and demands Moth's attention and affection.